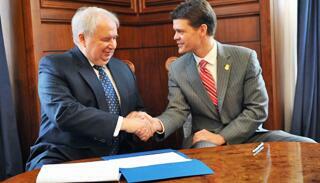 In a ceremony at the Russian Embassy on December 3, 2010, U.S. Immigration and Customs Enforcement (ICE) Director John Morton presented 21 historical documents to the Ambassador Sergey I. Kislyak of the Russian Federation to the United States. According to the ICE News Release, the documents dating as far back as the 18th century were reported stolen from national archives in Moscow and St. Petersburg between 1994 and 2002. For more on theft, recovery and return of library and archival materials from Russia and Iraq, consider attending the Restitution Conference at Cardozo in March 2011.